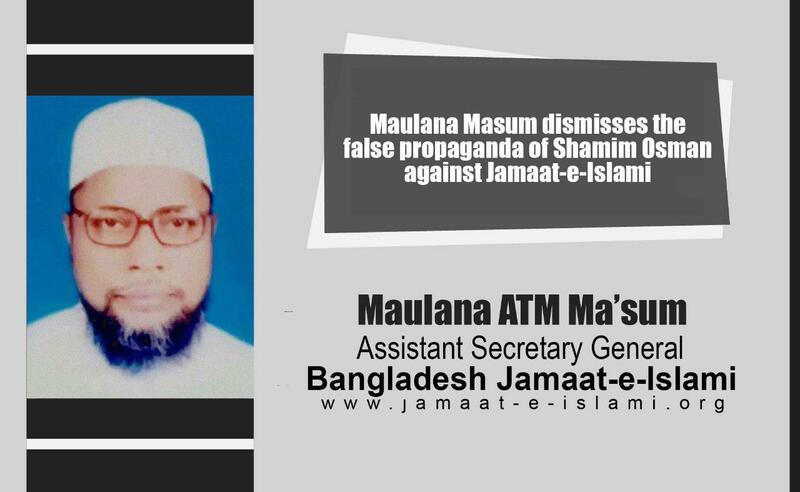 Assistant Secretary General of Bangladesh Jamaat-e-Islami, Maulana ATM Masum has issued the following statement on 26 December 2018 protesting and condemning the false allegations of Narayanganj district Awami League leader AKM Shamim Osman against Jamaat-e-Islami and Islami Chhatrashibir, which he had stated in a press meet on 25 December. “Narayanganj district Awami League leader AKM Shamim Osman in press meet on 25 December has anticipated that Jamaat and Chhatrashibir would create anarchy within next 48 hours. Such allegation is completely baseless. I am vehemently protesting and condemning such wrong assumption. Responding to his allegations, I want to reaffirm that Jamaat and Chhatrashibir have no link with Pakistani intelligence agency ISI. Despite our such repeated claim, this propagation and false campaign is really regrettable. The pro-government media is enthusiastically published the false statement of Awami League leaders, which they usually deliver against Jamaat-e-Islami. But these media are fully reluctant to publish our rejoinder. This reality clearly substantiates that the propaganda is being carried out against Jamaat-e-Islami just to demean Jamaat-e-Islami politically. Therefore, I am asking Mr, Shamim Osman to be refrained from making such baseless and concocted propaganda against Jamaat-e-Islami and Islami Chhatrashibir.